The Dunn's River Falls and Ocho Rios shopping tour from Montego Bay hotels and resorts is one of the most popular tours in Jamaica! This Dunn's River Falls tour is one of the most exciting experiences you will never forget! Journey along the north coast of the island on the shore line in fully air-conditioned and luxurious vehicles. Stop by the historical Columbus Park and delve into the history and the legacy behind the discovery of Jamaica by Christopher Columbus. Now, off to the famous Dunn’s River Falls with its breathtaking cascading falls that refreshes the mind, body and spirit of our visitors of all ages, your professional tour guide is very friendly, knowledgeable and ensures your comfort, safety and enjoyment on your trip. 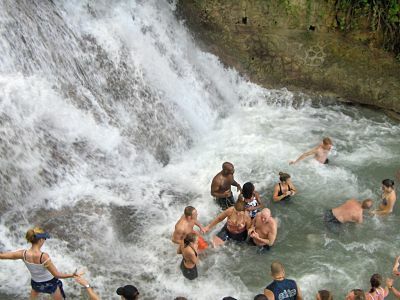 Your Dunn's River Falls tour itinerary includes admission to the falls, shopping, an Ocho Rios Highlight tour and you can choose to have a scrumptious meal at the famous Ruins at the Falls - Enjoy your buffet style feast with a backdrop of mini waterfalls, spectacular colored fish and great customer service. Our Dunn’s River Falls tour from Montego Bay hotels or resorts is not a tour to miss! Book today and experience the thrill! *Please note that rate quoted above for tour does not include the entrance fee to the falls.